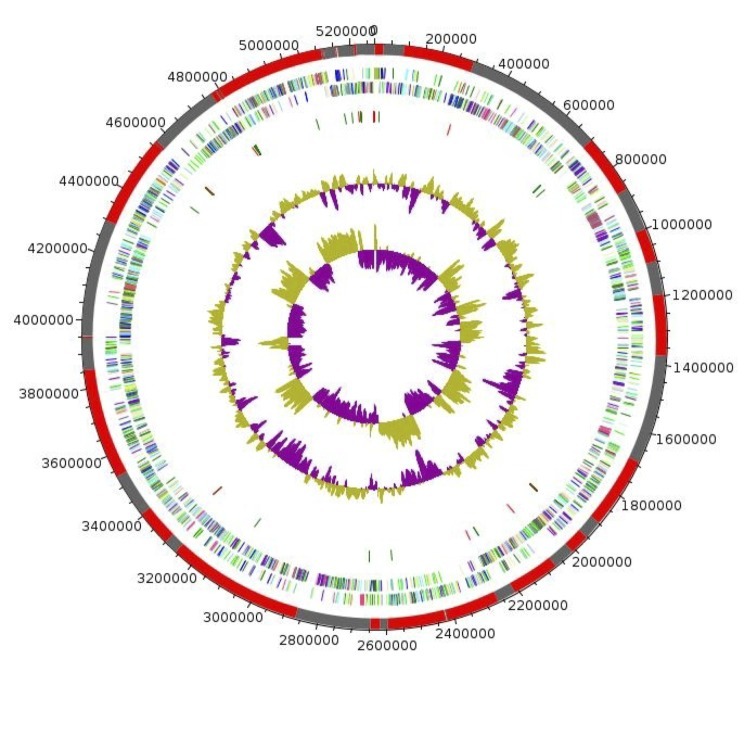 Non-contiguous finished genome sequence and description of Bacillus massilioalgeriensis sp. nov.
Strain EB01T sp. nov. is the type strain of Bacillus massilioalgeriensis, a new species within the genus Bacillus. 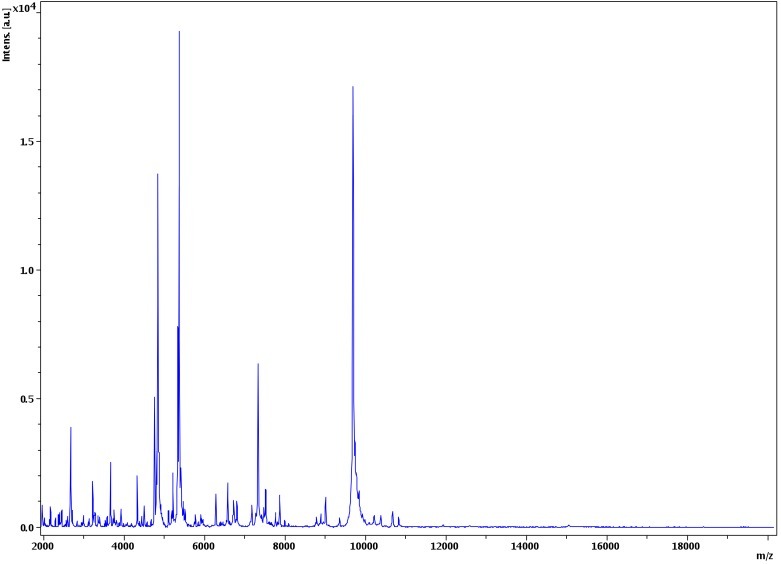 This strain, whose genome is described here, was isolated from sediment sample of the hypersaline lake Ezzemoul sabkha in northeastern Algeria. B. massilioalgeriensis is a facultative anaerobic Gram-positive bacillus. Here we describe the features of this organism, together with the complete genome sequence and annotation. The 5,269,577 bp long genome contains 5,098 protein-coding and 95 RNA genes, including 12 rRNA genes. Bacillus massilioalgeriensis sp. nov. strain EB01T (= CSUR P857 = DSM 27334) is the type strain of B. massilioalgeriensis sp. nov. 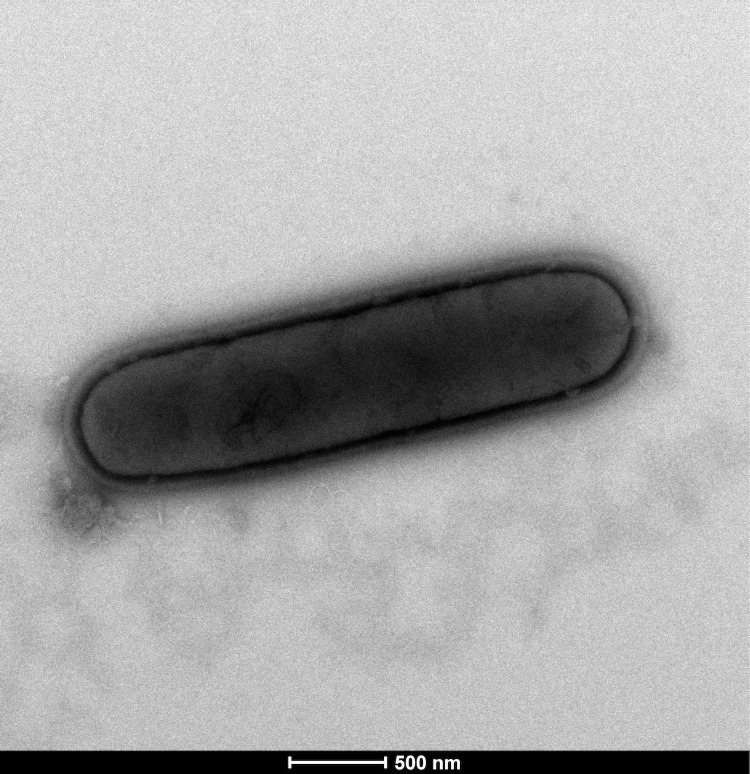 It is a new Gram-positive, facultatively anaerobic, motile, indole-negative, rod shaped bacterium with rounded ends. It was isolated from a sediment sample from the hypersaline lake Ezzemoul sabkha in the Oum-El-Bouaghi region in northeastern Algeria, which is an important wintering and resting site for several species of waterbirds, including the Greater Flamingo. This site is one of the Ramsar convention wetlands (Web Site). The genus Bacillus was created by Cohn about 142 years ago ,and mainly comprises Gram-positive, rod-shaped, aerobic or facultatively anaerobic, spore-forming bacteria. The genus includes 279 species and 7 subspecies with validly published names . Members of Bacillus genus are ubiquitous in nature, ranging from freshwater to marine sediments and from hot springs and desert sands to Arctic soils; many strains have been isolated from the gastrointestinal tracts of various insects and animals, from vegetation and from food . Bacillus strains are biotechnologically priceless because of their high capacity to produce a wide range of antimicrobial compounds, enzymes and other metabolites that can be used in industry [4,5]. Some species of Bacillus are pathogenic, such as B. anthracis (responsible for causing anthrax)  and B. cereus (a major cause of food poisoning) . Others are opportunists in immunocompromised patients, and may also be involved in various human infections, including pneumonia, endocarditis, ocular, cutaneous, bone or central nervous system infections and bacteremia .The current bacterial taxonomy is based on a combination of various phenotypic and genetic criteria [9,10]. However, the three essential genetic criteria that are used, comprising 16S rRNA gene based phylogeny , G+C content, and DNA-DNA hybridization [10,12] exhibit several drawbacks. 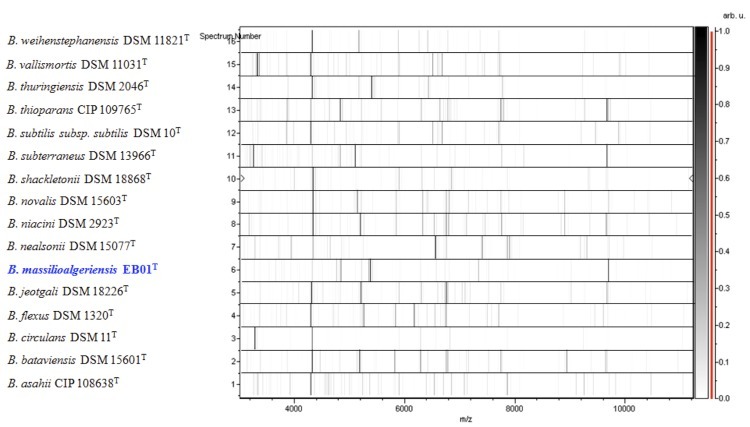 As a result of the recent decrease in the cost of genomic sequencing, it has been proposed that whole genome sequencing information and MALDI-TOF spectrum  be combined with the main phenotypic characteristics as a polyphasic approach strategy (taxono-genomics) to describe new bacterial taxa [14-26]. In July 2012, a sediment sample was aseptically collected in sterile bottles, 15 cm below the evaporite crust of the hypersaline lake Ezzemoul sabkha of Oum-El-Bouaghi region in northeastern Algeria. Samples were transferred in a cooler (4°C) to our lab in Algeria. Samples were processed the same day. Sediments were diluted 1:10 v/v with sterile saline water (0.9% NaCl) and vigorously shaken, Tenfold serial dilutions (10-1-10-5) of the sediment suspension were plated in Nutrient Agar (NA) medium (meat extract 1 g/l, peptone 5 g/l, yeast extract 2 g/l, sodium chloride 5 g/l, agar 15 g/l) and the plates were incubated at 30°C for 24-72 h. In order to obtain a pure culture, colonies were transferred to fresh NA medium. Bacillus massilioalgeriensis sp. nov. strain EB01T (Table 1) was isolated in July 2012 by cultivation under aerobic conditions at 30°C. 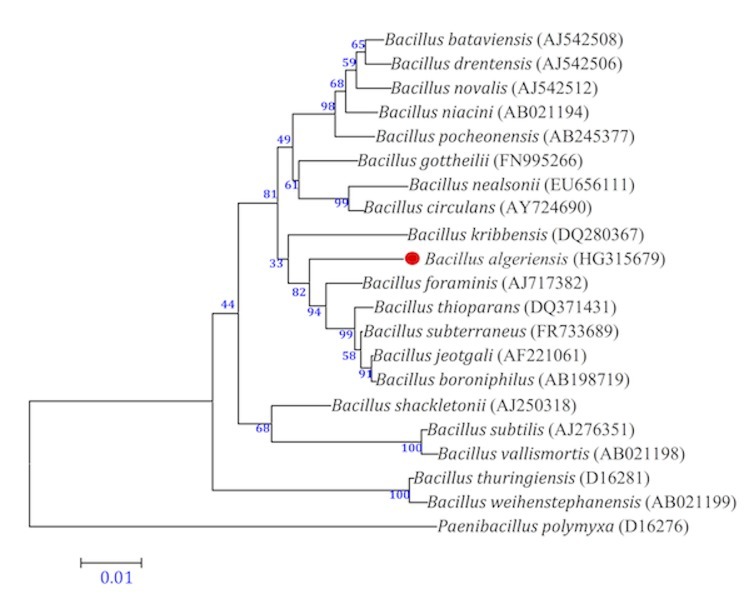 This strain exhibited a 97.0% 16S rRNA nucleotide sequence similarity with Bacillus subterraneus type strain DSM13966T (Figure 1), the phylogenetically closest validly published Bacillus species. These values were lower than the 98.7% 16S rRNA gene sequence threshold recommended by Stackebrandt and Ebers to delineate a new species without carrying DNA DNA hybridizidation . Six different growth temperatures (25, 30, 37, 45, 50 and 55°C), nine NaCl concentrations (0, 2.5, 5, 7.5, 10, 15, 20, 25, 30%) and ten pHs (5, 6, 6.5, 7, 7.5, 8, 8.5, 9, 10, 11) were tested. Growth occurred at all tested temperatures, however the optimal growth was observed at 37°C, between 0% and 2.5% NaCl concentration and pH in the range of 6.5-9 (optimum at pH 7). Colony morphology was observed on sheep blood agar (BioMerieux) after 24 h of aerobic incubation under optimal growth conditions, the colonies of strain EB01T were circular, light yellow, smooth and 2 mm in diameter. Growth of the strain was tested in anaerobic and microaerophilic atmospheres using GasPak EZ Anaerobe Pouch (Becton, Dickinson and Company) and CampyGen Compact (Oxoid) systems, respectively, and in aerobic atmosphere, with or without 5% CO2. Growth was achieved under aerobic (with and without CO2) and microaerophilic conditions but weak growth was observed under anaerobic conditions. 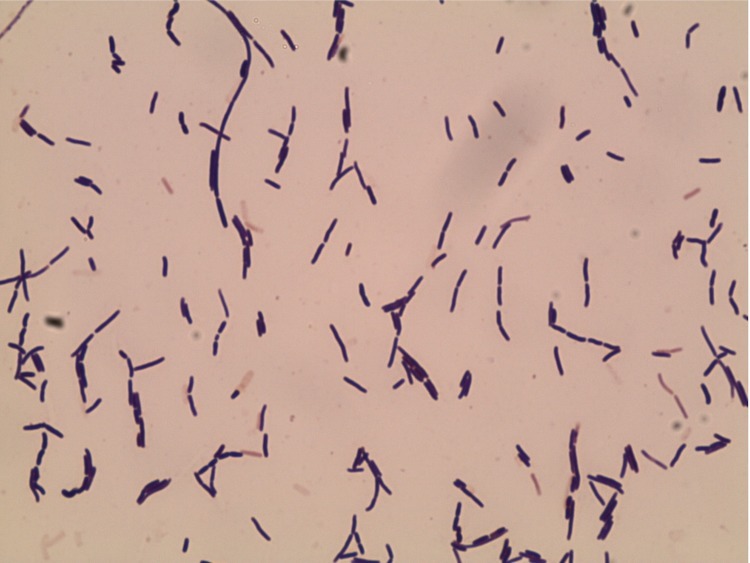 Gram staining showed Gram-positive rods (Figure 2). Cells grown on agar sporulate. A motility test was positive. The size of cells were determined by negative staining transmission electron microscopy on a Technai G2 Cryo (FEI) at an operating voltage of 200 kV, the rods have a length ranging from 2.4 μm to 4.9 μm (mean 3.6 μm) and a diameter ranging from 0.7 μm to 1.1 μm (mean 0.8 μm) (Figure 3). When compared to other Bacillus species [40-48], Bacillus massilioalgeriensis sp. nov. strain EB01T exhibited the phenotypic differences detailed in (Table 2). +: positive result, -: negative result, var: variable, w: weak positive result, na: data not available. Bacillus massilioalgeriensis sp. nov strain EB01T, was grown aerobically on 5% sheep blood enriched Columbia agar at 37°C. Three petri dishes were spread and resuspended in a 2 ml sterile Eppendorf tube containing 1ml of TE buffer with acid-washed glass beads (diameter ≤106 µm, Sigma, Saint-Quentin Fallavier, France). Three cycles of shaking were performed using a FastPrep BIO 101 apparatus (Qbiogene, Strasbourg, France) for 15 sec at level 6.5 (full speed). Then, the supernatant was placed in a new tube along with one hundred μl of 10% SDS and 50 µl of Proteinase K (Qiagen GmbH, Hilden, Germany) and incubated over night at 56°C. The digested mixture was used to perform DNA extraction using the classical phenol-chloroform method. The quality of the DNA was checked on an agarose gel (0.8%) stained with SYBR safe. The average nucleotide sequence identity of orthologous genes ranges from 64.54 to 91.06% among the 8 Bacillus species, and from 64.77 to 69.33% between Bacillus massilioalgeriensis and the other compared genomes (Table 6), thus confirming its new species status. † species and strain names, genome accession numbers, sizes and G+C contents. Bacillus massilioalgeriensis (ma.sil.io.al.ge.ri.en’sis. L. gen. masc. n. massilioalgeriensis, combination of Algeria, where strain EB01T was isolated and Massilia, the Latin name of Marseille, where the strain was sequenced). Strain EB01T is a facultative anaerobic Gram-positive, endospore-forming, motile and rod shaped bacterium with rounded ends. Growth is achieved aerobically between 30 and 55°C (optimum 37°C), between 0% and 2.5% NaCl concentration and pH in the range of 6.5-9 (optimum at pH 7). Growth is also observed in microaerophilic atmosphere, however, weak growth was observed under anaerobic conditions. After 24h growth on 5% sheep blood-enriched Columbia agar (BioMerieux) at 37°C, bacterial colonies were smooth, light yellow with 2 mm in diameter. Cells have a length ranging from 2.4 μm to 4.9 μm (mean 3.6 μm) and a diameter ranging from 0.7 μm to 1.1 μm (mean 0.8 μm). Mandell GL, Bennett JE, Dolin R. Principles and Practice of Infectious Diseases. Elsevier 2010, 4320p. Rossello-Mora R. DNA-DNA Reassociation Methods Applied to Microbial Taxonomy and Their Critical Evaluation. In: Stackebrandt E (ed), Molecular Identification, Systematics, and population Structure of Prokaryotes. Springer, Berlin 2006 p. 23-50. Ramasamy D, Mishra AK, Lagier JC, Padhmanabhan R, Rossi M,Sentausa E, Raoult D, Fournier PE. A polyphasic strategy incorporating genomic data for the taxonomic description of novel bacterial species. Int J Syst Evol Microbiol 2014; 64:384-391. Murray RGE. The Higher Taxa, or, a Place for Everything...? In: Holt JG (ed). Bergey's Manual of Systematic Bacteriology, First Edition, Volume 1, The Williams and Wilkins Co, Baltimore 1984; p. 31-34. Ludwig W, Schleifer KH, Whitman WB. Class I. Bacilli class nov. In: De Vos P, Garrity GM, Jones D, N.R. Krieg W. Ludwig W, Rainey EA, Schleifer KH, Withman WB. Bergey's Manual of Systematic Bacteriology, second edition, vol 3 (The Firmicutes), Springer, Dordrecht, Heidelberg, London, New York 2009, pp.19-20. Prévot AR. In: Hauduroy P, Ehringer G, Guillot G, Magrou J, Prévot AR, Rosset. Urbain A (eds) Dictionnaire des Bactéries Pathogènes, 2nd ed., Masson, Paris, 1953, pp. 1-692. Gibson T, Gordon RE. Genus I. Bacillus Cohn 1872; 174; Nom. gen. cons. Nomencl. Comm. Intern. Soc. Microbiol. 1937, 28; Opin. A. Jud. Comm. 1955, 39. In: Buchanan RE, Gibbons NE (eds), Bergey's Manual of Determinative Bacteriology, Eighth Edition, The Williams and Wilkins Co., Baltimore, 1974, p. 529-550.